Even your choices will have choices. P There is no one-size-fits-all retirement. That’s why there is truly no end to the choices you’ll find when you live at The Village at Unity Retirement Community. You’ll have options upon options in wellness, fitness, dining, travel, social activities, and more. We invite you to find out more at a complimentary lunch and tour. Call (585) 206-2103 to schedule. A 130-year-old can be tech-savvy, too. Canandaigua National Bank & Trust’s legacy dates back to 1887, but our technology is on point. We have a long history of meeting the needs of our customers—and today, that means providing smart solutions for convenient banking. With CNB, you can tap to pay with your preferred mobile wallet app. Manage and secure your CNB Debit Mastercard® with CardValet®. Use online, mobile app, or text banking to get balance information, transfer funds, and view your transaction history. And much more. To learn more about CNB’s online and mobile banking solutions, visit CNBank.com/Online. *No fee for mobile deposits to consumer deposit accounts. A fee of $0.50 per mobile deposit to business deposit accounts. Apple, the Apple logo, and iPhone are trademarks of Apple Inc., registered in the U.S. and other countries. Apple Pay and Touch ID are trademarks of Apple Inc. CardValet is a registered trademark of Fiserv, Inc. Message and data rates may apply, including charges from your communications service provider. Rochester Minimalists to discuss tiny home living The group Rochester Minimalists will present a “Tiny Homes Panel Discussion” from 6:30 to 8:30 p.m., Wednesday, April 3, at Irondequoit Public Library (room 114), 1290 Titus Ave., Rochester. The meeting is free and open to the public. Participants will hear from Erika Guli and Mackenzie and Logan Rockcastle, who currently reside in tiny homes, and Eric Menz, a registered engineer with a nonprofit focused on sustainable housing and workforce development. Rochester Minimalists is a group of individuals looking to explore their relationship with things, what brings value to their lives, to reduce their environmental footprint and question consumerism. Support group open to those divorced, windowed Separated? Divorced? Widowed? Ending a significant relationship? Neutral Ground Support Organization, a nonprofit, peer-support group, will hold its spring orientation meeting at 7 p.m., April 4, at Henrietta United Church of Christ 1400 Lehigh Station Road. Participants are encouraged to arrive during coffee time, 6:30-7 p.m. For more than 40 years Neutral Ground has provided groups for people to express and share their thoughts and feelings and to develop a firmer foundation on which to rebuild their lives. Orientation is free but an annual membership of $30 is required to join a closed group. For additional information, visit https://NeutralGroundSupport. org. Therapy for Metastatic Breast Cancer,” and “Mindfulness, Healing, and Self Care.” The panel will also feature two speakers who are living with metastatic breast cancer: Nancy Gramkee-Cuer and Amy Schnitzler. This regional event is offered to those living with advanced breast cancer and to others concerned about breast cancer issues. Family, friends, caregivers and care providers are also invited. Funding is provided by M&T Bank, Rochester Division, in memory of their friend and colleague, Cindy L. Dertinger. Admission is free, however seating is limited and reservations are required. For more information, call 585-473-8177. Vegan group to hold fundraiser event The Rochester Area Vegan Society will sponsor a fundraiser dinner at 6 p.m., April 14, at Brighton Town Park Lodge, 777 Westfall Road, Rochester. Dinner will be catered by Eden Restaurant. Cost to attend is $35 per person. All proceeds will benefit the mission of the vegan society, which is to advocate a diet which is entirely plant-based and avoids the use of all animal products including eggs, dairy, fish, and all flesh. After dinner, physician Ted Barnett, co-coordinator of the Rochester-Area Vegan Society, will give a brief and lively Powerpoint presentation on the many vegan developments in Rochester and beyond. For more information, call 2348750 or visit https://rochesterveg. org. You may send a check by mail to RAVS, PO Box 20185, Rochester NY 14602. A group of 14 local artists will sponsor a pop-up arts and craft show with original items ranging from wearable art to ceramics, wood, glass, photography and other items. The event will take place from 4 to 8 p.m., April 26; 10 a.m. to 5 p.m., April 27; and form 10 a.m. to 4 p.m. April 28 at the Clover Center for Arts and Spirituality, 1101 Clover St. in Rochester. The event is free and the location has plenty of parking space. For more information, call 585-5864492 or send an email to jrusitzk@ Rochester.rr.com. held at St. Paul’s Episcopal Church, East Avenue at Westminster Road, Rochester, across from the George Eastman Museum. • 10 a.m.: “Hearing Other People’s Experiences (HOPE)” will take place at church vestry room. Prospective, new or experienced hearing aid users can share their experiences, questions, and hearing loss journeys in an informal round table discussion facilitated by retired audiologist and hearing aid user Joseph Kozelsky. • 11 a.m. to 1 p.m. Parish Hall. Program begins at noon. “Rochester Academy of Medicine: Its Connection with Hearing Loss” with Allis D’Amanda. She will share the history of the mansion housing the Rochester Academy of Medicine at 1441 East Ave., which was built in 1912 by prominent citizen Edmund Lyon. D’Amanda is a Lyon descendent. • 7 to 9 p.m. Parish Hall. Program begins at 8 p.m. “Cochlear Implant Technology Update: What’s New at UR Audiology? with audiologist Megan Wightman. The world of cochlear implants seems to change monthly with the release of new accessories, implants and sound processors. Wightman will explore the latest implant technology used at UR Audiology and who might benefit from it. All HLAA programs are free. Anyone interested in hearing loss is welcome. For more information, view the organization’s web site at hearinglossrochester.org or telephone 585-266-7890. Free dental care offered to 100 people in Greece Dentist Oliver Cabrera of Greece Family Dentistry and Implantology will host Dentistry From The Heart, an event that will provide free dental care to the first 100 patients who show up on his practice. It will take place from 8 a.m. to 4 p.m., June 1, at Greece Family Dentistry & Implantology, 120 Erie Canal Dr., suite 150, Rochester. Last year the practice provided more than $24,000 in free dental care to nearly 70 patients. Services provided range from extractions, fillings and cleaning. “Now more than ever, I know there’s people out there that need dental care, but have no means to afford treatment — whether they’re out of a job, or just don’t have dental insurance,” said Cabrera. “This Dentistry From The Heart event is our way of providing a necessary service to the community, and ‘being there’ for the people who are in need of dental treatment.” Dentist Vincent Monticciolo, based in New Port Richey, Fla., founded Dentistry from the Heart in 2001. Participating dentists have donated over $25 million and helped over 500,000 people since its inception. Got an event to share with our readers? Send us an email by the 10th of each month. “I had no idea nerves can heal. The tingling in my hands is 95% better. I was told it would only get worse.” - Beau T.
We offer a scientific, 4-step, proven approach that promotes healing in your nerves and can reverse your symptoms by: 1. Increasing blood supply to your nerves. 2. Repairing and re-educating your nerves. 3. Increasing the blood flow in your feet or hands. 4. Increasing your balance and mobility. “I’m now off all my neuropathy meds. And I can feel my gas and brake pedals now!” - Benny H.
ew nurses are predominantly working 12-hour shifts and nearly half work overtime, trends that have remained relatively stable over the past decade, finds a new study by researchers at NYU Rory Meyers College of Nursing. In addition, 13 percent hold a second job, according to the study published in the Journal of Advanced Nursing. Changes in health policy in recent years — from the passage of the Affordable Care Act and increased access to healthcare to the recession, which delayed some nurses’ retirements — have had implications for nurses and the hours they work. “Research shows that nurses’ hours, scheduling patterns, and overtime have been associated with patient safety and nurse well-being,” said Amy Witkoski Stimpfel, PhD, assistant professor at NYU Meyers and the study’s lead author. “However, we wanted to understand what these changes in the global economy have meant for the newest generation of nurses. Stimpfel and her colleagues analyzed surveys from more than 4,500 newly licensed nurses in 13 states and Washington, D.C., collecting information on nurse demographics, education, work attributes, and attitudes. Specifically, nurses were asked about their work schedule, daily shift length, weekly work hours, overtime, and whether they worked a second job. Four different cohorts of nurses — those first licensed in 2004-2005, 2007-2008, 2010-2011, and 20142015—completed the survey soon after being licensed; these cohorts were compared to observe changes over time. The researchers found that newly licensed nurses work an average of 39.4 hours a week, predominantly in 12-hour shifts. More than 13 percent report having a second paid job. New nurses prefer working the day shift, and the preferred shift length is 12 hours. Twelve percent of nurses report working mandatory overtime (an average of less than an hour in a typical week), and nearly half (45.6 percent) work voluntary overtime (an average of three hours in a typical week). The researchers observed nuanced changes in overtime hours during the decade studied: there was a decline in both mandatory and voluntary overtime during the economic recession by about an hour per week, but overtime hours rose in the most recent cohort. Thomas Wormer, M.D. General surgeon has practiced at Thompson Health for 30 years — he talks about his profession, changes in medicine and his volunteer work in Haiti Q: You are a general surgeon at Thompson Health. Can you walk us through what you do in a hospital like Thompson? A: I’ve been practicing here 30 years. General surgery in smaller communities really encompasses gastrointestinal surgery, colorectal surgery, breast cancer, skin cancers, endoscopies, wound care. So, it’s a pretty broad range of areas that we take care of. Q: Have you found that your role has changed over the years with the centralization and networking of hospitals? A: Well, we don’t do as much trauma as we used to when I first got here, which isn’t a bad thing in my opinion. It’s been pretty well-proven that trauma patients do better in specialized trauma facilities. Q: Have the demographics of Canandaigua changed much? Are you seeing different types of patients with different issues than before? A: There have been some changes. I think our patient population has gotten somewhat older, somewhat sicker, with more chronic illnesses. But not any dramatic changes. Q: Your work sometimes takes you outside the Finger Lakes region. Tell us about your missions to Haiti. A: So, I’ve been to Haiti five or six times. We’ve gone to a town called Milot, near Cap-Haitien in northern Haiti. We worked at a hospital there that’s primarily run by the Haitian physicians and administrators, but is affiliated with a hospital in New Jersey called Sacred Heart. Mostly what we’ve tried to do is help the Haitian surgeons, give them a little break and take care of the more routine cases to cut down on their backlog. very helpful. A cardiologist went with us one time and said, “Haiti is really the place where you need the generals, the surgeons with a broadbase who know how to do a lot of things.” They don’t have the specialists that we do in this country. Q: What kind of impact do you try to have while you’re there, and what impact does it have on you? A: It certainly makes me appreciate what we have in this country more. You find yourself working there with recycled instruments and makeshift materials. You have to be more innovative there. In terms of our impact on Haiti, we’re a pretty small group, and it’s a pretty small hospital, but I guess every bit helps. Q: When you’re training younger surgeons in a small city setting like Canandaigua, what kinds of expectations do they have? A: We’re kind of semi-rural. We pretty much have the full spectrum of specialties here. I think the one thing some of the younger surgeons struggle with is just the amount of night-call they have to take. It’s a smaller pool of surgeons to cover the hospital. On the other hand, I think you really become part of the community in a way you wouldn’t in a larger city. You see your patients on the streets, at Wegmans, at the post office. Over time, you become more and more part of the community itself rather than just working at a hospital. Q: Do you find recreation opportunities are a big selling point for the area? I understand you’re a fly-fisher yourself. A: I am, but I haven’t done it in a couple years due to a shoulder injury. I haven’t been able to get out as much. Q: What procedures do you end up doing most often? A: Like most general surgeons, I do a lot of gall bladders, hernias, things like that. I personally do a lot of breast cancer surgery, colon cancer surgeries, a lot of endoscopies, screening for colorectal cancer, that sort of thing. Q: Having practiced for 30 years in one location, do you find you’re able to have more of a continuum of care with individual patients than surgeons might normally have? A: Yeah, with a 30-year time frame, I’m sometimes getting second generation family members coming through now, which is kind of nice. I think in a lot of ways, it probably makes it more fun for me and more comfortable for them. Q: What kind of impact do you feel you’ve had on the community, and what kind of impact do you want to leave? A: I think that the hospital itself is growing and part of that is because the people who have been here have worked very hard to gain the hospital a good reputation for patient care. I hope the community itself will be a little healthier for us having been here. And going forward, I think there are a lot of great, younger doctors who are coming in and starting to take over. So, we want this to be a place where younger doctors want to come and work. Q: What do you think new doctors are looking for? A: I think up-to-date technologies. We’ve been doing robotic surgeries here for about seven or eight years. I think that, for a small hospital, we’ve been very innovative. We were one of the first hospitals in New York to do routine laparoscopic surgery, and that’s become pretty much the standard of care nowadays. It was a revolution in surgery. When I finished my training, we did almost all our abdominal surgery with open incisions. Recovery was usually several days in the hospital. Back to work was six to eight weeks. Now we’re talking about sometimes being back to work the next day. But when we started it was still pretty radical. We’ve been on the forefront of a lot of those changes. Q: With Upstate New York weather being what it is, do you sometimes end up with cases that would, in normal weather, be referred to a bigger hospital? A: We haven’t recently, but I remember one Super Bowl a driver took out a power line. Everyone lost their television signal. Nobody was happy about that. t seems that everywhere you look, minimalism — the “life-changing art of tidying up” — is all the hype. As it turns out, a lifestyle based on “less is more” can actually make you happier. Studies show that clutter can distract us, make it difficult to relax, trigger feelings of guilt and embarrassment, inhibit creativity and productivity and cause us to waste time looking for things we can’t find. A study published in Current Psychology in June 2018 showed that clutter can negatively impact mental well-being, and induce a physiological response including increased level of cortisol, a stress hormone. Well, now is your chance to kick the clutter once and for all! 30-Day Minimalism Game Join the Rochester Minimalists in April as its members take on the “30-Day Minimalism Game.” The Rochester Minimalists is a group of individuals looking to explore our relationship with things, evaluate what brings value to our lives, to reduce our environmental footprint and question consumerism. Created by Ryan Nicodemus and Joshua Fields Millburn, also known as “the minimalists,” the 30 Day Minimalist Challenge is a fun way to get rid of more than 450 items over the course of one month. While it’s good to start on the first of the month, you can really begin the challenge whenever the mood strikes you. Here’s how to play! • On the first day of the challenge, you get rid of one item; on the second, two items; on the third, three items, and so on and so on until you’ve completed 30-days. • How you count items is up to you. While it may seem easy to find enough items to get rid of in the first two weeks, it gets harder as the challenge progresses and the number of items you need to part with climbs. • Whether you trash it, sell or donate it, the goal here is to get the items out of your home by midnight. If that’s not possible, it’s best to put the items somewhere where you will not be tempted to introduce them back into circulation. Set a deadline for getting rid of everything once the challenge is complete. You might want to sell, recycle at the Monroe County EcoPark, or to get rid of some of your items in the Second AnnualFree-For-All on May 4. • Invite a friend to complete the challenge or join the Rochester Minimalists group on Facebook as its members take on the challenge during the month of April! Having a buddy system keeps you accountable, helps you stay inspired and makes it more fun! Improve your strength and balance! Second Annual Monroe County Buy Nothing Free-For-All So, you completed the 30-Day Minimalism Challenge and now you’ve got a bunch of stuff that you’re not sure what to do with. Save yourself the hassle of selling your goods on Craigslist or in a yard sale. Pass it forward at the Monroe County Buy Nothing Second Annual Free-For-All from 10:30 a.m. to 3 p.m. on Saturday, May 4 at the Thomas P. Ryan Community Center located at 530 Webster Ave. in Rochester. This is an event for the community to share items with one another for free! There will be no cash exchanged or bartering allowed. Bring what you wish to give away. Receive what others may no longer need. Discover the power of neighbors helping neighbors! Be sure to RSVP by emailing amycavalier@hotmail.com if you plan to bring items to give away so we can be sure we have enough space for everyone who participates. Buy Nothing groups are hyper-local, adult-only, gift-based economies on Facebook. Members must live where they give. Once approved, you can give away, ask for or share anything you would like with your neighbors. There are currently more than a dozen Buy Nothing communities in Monroe County. To locate a group in your area, visit https://buynothingproject.org/find-a-group/. of program $120 due at pre-test. ThompsonHealth.com/SrFitness to print medical clearance form. by Local News, Inc. Distribution: 33,500 copies throughout more than 1,500 high-traffic locations. Editor & Publisher: Wagner Dotto • Associate Editor: Lou Sorendo Writers: Jim Miller, Deborah J. Sergeant, Gwenn Voelckers, Anne Palumbo, Chris Motola, George W. Chapman, Payne Horning, Sharon Osborne, Amy Cavalier, Daniel Croft, MD, Christine Green • Advertising: Anne Westcott, Linda Covington • Layout & Design: Dylon Clew-Thomas • Office manager: Beth Canale No material may be reproduced in whole or in part from this publication without the express written permission of the publisher. The information in this publication is intended to complement—not to take the place of—the recommendations of your health provider. Consult your physician before making major changes in your lifestyle or health care regimen. employees in higher wages, which would then ameliorate the increased payroll taxes? Or will they continue to pay a percentage of the premium to the single payer? On average, employers cover about 67 percent of the employee’s health insurance. sive, you can be charged per page. It can get expensive, especially if a hospital record. HIPAA regulations state you are entitled to a digital copy of your record if the provider has the capability to do so. In response to complaints from consumers about providers blocking/impeding electronic access to their data, the Department of Health and Human services recently made public several rules that would allow consumers easier access to their record via the app of their choice, like a smartphone, at no additional cost. The healthcare industry has been slow to adapt to available technology. In fairness, providers cannot simply raise prices to pay for their investment in information technology because their reimbursement from their party payers is fixed. Unaware of what a procedure cost, consumers inadvertently can drive up their own premiums by unwittingly using more expensive providers. For example, your insurance benefit summary says you have a $50 copay for an outpatient MRI. So, no matter where you go for the MRI, all you know is you owe $50, regardless of the cost. Your insurance company has different payment schedules per MRI provider. It often depends on the negotiating power of the MRI provider. Larger hospital / health systems can demand higher reimbursement than smaller facilities and private physicians. By inadvertently getting your MRI done where the insurer has to pay more, you increase the expense to the insurer which causes your premium to go up. In the cases where you have a 20 percent copay, you still don’t know the overall cost and may be going to the highest price facility. George W. Chapman is a healthcare business consultant who works exclusively with physicians, hospitals and healthcare organizations. He operates GW Chapman Consulting based in Syracuse. Email him at gwc@gwchapmanconsulting.com. • New York has the third highest need for organs but has the second lowest donor rate registration rate. • 35 percent of NYS adults are registered organ donors compared with 58 percent of US adults who are registered organ donors. • 9,500 New Yorkers are waiting for an organ • 17,000 Americans have been on the waiting list for more than five years Source: Excellus BlueCross BlueShield said Harris. In 2017 New York state expanded outreach and added legislation to simplify the process to register as an organ and tissue donor. • 16- and 17-year-olds became eligible to join the registry when applying for a driver’s license or permit • New Yorkers became eligible to sign up for the Donate Life Registry when applying for or renewing a health insurance plan on the state’s health plan website • Lauren’s Law was made permanent in NYS, requiring customers to check one of the two boxes related to organ donation in order for their DMV application to be processed. NYS Department of Health data from October 2018 show nearly 38,000 of the new organ registrations in previous 12 months were 16- or 17-year-olds and approximately 91,000 new registrations came from the health insurance marketplace. While in the hospital Zachary had a visit from Lauren Shields, the woman who inspired Lauren’s Law. After receiving a life-saving heart transplant at age 9, she has become a fierce advocate for organ donation. He says she’s his role model and plans to follow her lead. “I don’t always want to be known as the kid with a heart transplant,” Zachary said. “I want to be known as the kid who made a difference.” Submitted by Excellus BlueCross BlueShield. If so, you may qualify for a new investigational eye drop research study! If you have previously been diagnosed with glaucoma or increased eye pressure and are at least 18 years of age, we invite you to participate. The study involves 7 office visits over the course of approximately 11 weeks. You may be compensated for your time and travel. Do you have glaucoma or high eye pressure? 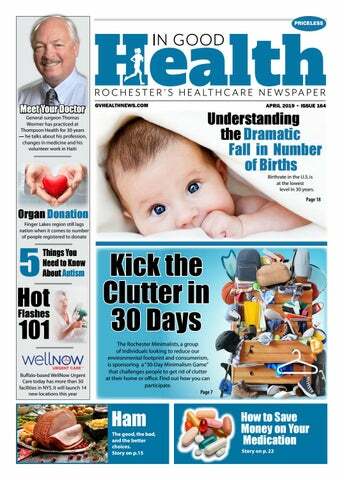 Advertise in the Third Annual Rochester Dental Guide. Get your message to 100,000 health-conscious readers Call your sales representative for more information. head injuries, general neurological disorders, and more. Q: Are there other therapy services you provide? A: We have staff certified in specialty therapy programs such as LSVT Big & Loud, an intensive physical therapy program for people with Parkinson’s and other neurological disorders. We can help people regain physical strength and improve clarity in their speech. We are one of the only outpatient providers in the area to provide VNG testing, which is a diagnostic tool used to help patients who suffer from balance or dizziness problems. We also offer Orthopedic and Spine Rehabilitation, and Manual Therapy. and create a customized driver training program to help older drivers maintain their driving independence. Q: What makes your rehabilitation unique? A: Our patients benefit from individualized treatments and 45 minute one-on-one therapy sessions with our highly trained and professional staff. Our team of professionals has more than 30 years of experience in rehabilitation therapy. Q:What other services are available on the Jewish Senior Life campus? A: Jewish Senior Life is a Continuing Care Retirement Community (CCRC) offering all levels of care on a single campus, from independent living to skilled nursing care. We also have a variety of community programs and services for people living outside of our campus such as physician house calls for the homebound, and companion care. We serve people of all ages, faiths and ethnic backgrounds. here has been a ten-fold increase of autism prevalence in the last 40 years, according to the Centers for Disease Control and Prevention. There are three million individuals in the United States and tens of millions worldwide who have autism. “Although autism prevalence has increased, this is likely due in large part to increased awareness and assessment for autism spectrum disorders and changes in diagnostic criteria over time,” said Jara Johnson, developmental behavioral pediatrician at Rochester Regional Health. “That is the case rather than an epidemic increase in the incidence of autism.” Here are five key facts you need to know about autism in children. Don’t believe the stereotypes Because autism is still something that is not readily talked about, there continues to be a few myths that continue to stand out. Even in television shows some people with autism are shown in a stereotypical and one-dimensional lens. There are two myths that are very prevalent that Johnson wanted to dispel. “Vaccines do not cause autism,” said Johnson. “Autism likely results largely from genetic factors, though for some there may be environmental factors that impact risk. There have been many large studies that show no link between autism and vaccines.” Secondly, people with autism can show affection. “Those with autism can often give and receive affection, though they may do so on their own terms and it may not be in conventional ways,” said Johnson. problems — and lack of sleep can be a setting event for these behaviors to be more likely to occur,” said Julie Cenzi, licensed behavior analyst, mental health counselor, and owner of Spectrum Behavioral Counseling Service in Rochester. “Having adequate amounts and quality of sleep are important so that children may function better in school and will help improve academic ability.” Children also need sleep for their own mental health benefits. Cenzi said that otherwise, issues such as depression or anxiety may occur. Sleep issues can also affect the rest of the family. “This leads to decreased patience, increased irritability and depression in other family members as well,” she said. ly lack of eye contact, and autism. Lack of eye contact can be one of the earliest signs of autism in infants or toddlers. The exact reasons for eye gaze differences are not clearly understood. “Some research suggests that it may even be an unconscious behavior,” said Johnson. “It’s possible that it could be related to the way the brain processes visual information. Most people are naturally wired to use eye contact as a form of nonverbal communication, which often conveys interest and attention. Those who are typically developing not only use eye gaze as a form of communication, but they also coordinate that gaze with gestures, facial expressions, and verbal language.” to see your physician 5.Do notIn wait 2018, the CDC deterSo why do kids on the spectrum experience sleep disturbances? Heidi Connolly, chief of pediatric sleep medicine services at University of Rochester Medical Center, said that it’s not entirely clear, but it’s a common complaint. She said that hormones offer a few clues. Melatonin, a natural hormone produced by the body, helps set the circadian rhythm of waking and sleeping. It’s usually released close to bedtime. “It looks like children with autism aren’t as good at making that nighttime surge of melatonin,” Connolly said. “Giving two to three mg. before bed can be helpful.” What doesn’t help is giving the child attention when awakening at night. “It perpetuates the behavior of getting up in the night,” Connolly explained. She recommends a night time routine illustrated by a picture board or other display, as does Cenzi, since children on the autism spectrum generally do well on routines because they know what to expect next. Jara Johnson, developmental behavioral pediatrician at Rochester Regional Health. mined that approximately one in 59 children are diagnosed with an autism spectrum disorder. The American Academy of Pediatrics recommends that all children be screened for autism at their 18- and 24-month well-child checkups. If you’re not sure if your child has been screened, you can ask for a screening. You can also complete the online screener, print the results, and bring them to your healthcare provider to discuss your concerns. Much was not previously known about what causes autism, but research is showing that environmental influences and rare gene changes cause autism, which impacts early brain development. Autism does not discriminate and can affect children of all social classes and ethnicities. Remember to look for the signs and to get your child screened. “If a parent or caregiver is concerned that their child may have an autism spectrum disorder, it is suggested that they speak with the child’s primary care physician sooner rather than later to discuss their concerns,” added Johnson. oin and cocaine. As an increasingly popular method for delivering nicotine, e-cigarettes deserve more scrutiny. Some major medical groups, including the American Cancer Society, have recommended only using e-cigarettes for smoking cessation when a person has failed FDA-approved methods, including nicotine replacement therapies (patches, lozenges or gum) and prescription medications like bupropion (Wellbutrin) and varenicline (Chantix). But those who choose this strategy must switch completely from combustible products (no dual use) and have a clear plan to stop e-cigarette use. Although we do not yet know the long-term health effects of e-cigarettes, we do know that they are not risk-free. The fact that smokers turn to e-cigarettes as a quit strategy should serve as a call for health care providers to improve support for effective cessation efforts. We must do everything we can to help all smokers quit. If you want to quit nicotine, talk to your health care provider and contact the New York State Smokers’ Quitline at 1-866-6978487 or nysmokefree.com. We are here for you. Physician Daniel Croft is assistant professor of pulmonary and critical care medicine at University of Rochester Medical Center. caring for a loved one who has dementia (any type).  All procedures are free and subjects receive up to $200 for participation. Scheduling is flexible and optional respite care is available for your loved one. Periods of enrollment are open June thru late August (call anytime). Providing Independent and Enriched Living apartments to seniors in the Finger Lakes for over 20 years. Comprehensive Autism Services for over 20 years! IN AUTISM SERVICES IN ROCHESTER AND THE FINGER LAKES. We are proud to be a lead agency in the development of the Golisano Autism Center, to expand and enhance autism services in Greater Rochester and surrounding areas. diologist at Brigham and Women’s Hospital in Boston. He said it used to be “incredibly rare” to see anyone under age 40 with a heart attack. “Based on what we are seeing, it seems that we are moving in the wrong direction,” he said. These young heart attack victims also have the same risks of dying from another heart attack or stroke as older patients. who suffered a heart attack, researchers found. Younger patients drank less alcohol but were more likely to be substance abusers — 18 percent used marijuana and 9 percent used cocaine. For the study, Blankstein and colleagues collected data on close to 2,100 patients under age 50 admitted to two hospitals for heart attacks. “Many people think that a heart attack is destined to happen, but the vast majority could be prevented with earlier detection of the disease and aggressive lifestyle changes and management of other risk factors,” Blankstein said To protect yourself, he recommends avoiding tobacco, getting regular exercise, eating a hearthealthy diet, losing weight if you need to, managing your blood pressure and cholesterol, avoiding diabetes, and staying away from cocaine and marijuana. In a related study, Blankstein’s team found that one in five patients who suffer a heart attack before age 50 also have diabetes. Diabetics are more likely to have repeated heart attacks and die from a heart attack than other people. These patients need aggressive treatment, Blankstein said. Some diabetes medications can reduce heart attack risk, he added. The findings are to be presented March 17 at the American College of Cardiology’s annual meeting in New Orleans. Research presented at meetings is considered preliminary until published in a peer-reviewed journal. environment,” Ghazle said. “As you work in this field, you’re challenged on a daily basis to provide the best care, best examination and provide high quality diagnostic images.” He believes that the work includes elements of other professions, including medical engineering, industrial engineering, mechanical engineering and medical care. Other related opportunities could include managing, education and working for companies that build and sell the equipment. Ghazle said that repetitive motions when performing ultrasounds can result if technicians don’t use proper ergonomics. Because of the high demand, another challenge is the size of the workload for some people. “The field is increasing all the time,” Ghazle said. ichelle Polatas of Parma didn’t set out to become addicted to heroin. But the cycle of addiction began when an old boyfriend offered 18-year-old Polatas the drug. There were arrests, an overdose, theft and weeks in and out of rehab facilities. Her mother, Laurie Polatas, was emotionally and physically exhausted. “It was beyond my parental knowledge. It took her dad and I by surprise; we just didn’t understand what was going on. We were a normal family,” Laurie said. In the midst of this struggle, Michelle ended up in the Monroe County Correctional Facility. Her family was confused and hurt and “hiding under a rock of shame,” Laurie said. She felt an uncomfortable feeling of embarrassment and self-blame. But she knew this shame wasn’t serving her or her daughter. She needed to climb out from beneath that rock and take action. In October of 2014 she reached out to officials at the Hilton school district, the village mayor and other local citizens. “Maybe we could come together and make our community healthier,” Laurie Polatas recalled telling them. She contacted the National Council on Alcoholism and Drug Dependence-Rochester Area for help in organizing and forming a coalition. It was through its guidance and mentoring that she learned of the Community Anti-Drug Coalitions of America (CADCA). CADCA’s mission is to assist coalitions nationwide as they create and maintain safe and drug-free communities. Polatas and the team she brought together registered as a coalition under CADCA and today they are a 501 (c) (3) nonprofit coalition called Hilton Parma Drug Intervention Community Education (HPDICE). area including school administrators and counselors, students, local towns and villages, a representative from Monroe County Office of Mental Health, and church groups. Parents and family members of those suffering with substance abuse issues also make up the core group. Kathryn Hogan is one of those parents. Her son is addicted to drugs, and she fears he may always be dependent on them. As HPDICE’s communication coordinator she has found great support among the coalition members and believes that the work they do is extremely important. “We’re really trying to make the world better for our children. Everyone is very valued here. This is an exceptional committee,” she said. Part of HPDICE’s educational mission is to end the stigma associated with drug addiction. “My whole thing when I jumped into this committee was no more shame and no more blame,” said Hogan. “I’m done with this whole stigma.” Both Hogan and Polatas noted that the negative views many in society have against those addicted to drugs, particularly opioids, prevent people from seeking help for themselves or a loved one. This stigma can often make those in the middle of such a situation feel isolated and helpless. Medical professionals agree that alcohol and drug addiction is a disease and that opioid overdose is a nationwide epidemic. The Centers for Disease Control and Prevention (CDC) reports that in the US an average of 130 people die every day of an opioid overdose. HPDICE is working to educate people on these and other substance use statistics locally and nationwide in the hopes that more people will help find practical solutions rather than judging those suffering. Laurie Polatas, left, and Kathryn Hogan of the nonprofit coalition called Hilton Parma Drug Intervention Community Education (HPDICE). violence, natural disasters, homelessness or neglect among many other difficult situations. Children with more ACEs are at a higher risk of addiction. “There’s a really pretty complicated emotional and mental health component to this drug stuff,” Hogan said when discussing the multitude of issues that contribute to risky behaviors and addiction. The upside is that schools are now much more aware of childhood risk factors and are actively educating kids on healthy coping skills, said Hilton High School Prevention Counselor Jillian Peer. “I have lists and lists of coping skills that are healthy and not dangerous. It takes time for students to find what might work. What works for me might not work for you. It’s a process that takes time.” Some coping techniques include exercises like deep breathing, journaling and other mindfulness activities. We pick up 7 days a week. One Touch Ultra & Freestyle Lite. All Brands Considered. Up to $50. hours, walk-in service and the opportunity to check in online, urgent care centers can fulfill patients’ needs in a way that traditional doctors’ offices often cannot. Financial burden is another consideration. Urgent care centers can sometimes provide an alternative to emergency departments and facility fees. It’s a way to provide middle ground to care for non-emergent needs. We’re cognizant of all of these things — capacity, hours, convenience and more. We don’t take our status for granted and are always looking for new ways to stay connected with patients. Trust is earned, not to be expected. for those deserving benefits. For best results, let me represent you. one good sperm. Men should have good sperm well past 50. The fact that they don’t have one good sperm is ridiculous.” As for women, she said that using contraceptives that are only progesterone without estrogen causes women to become menopausal as far as their egg health goes. Once they discontinue contraceptives with the hopes of conceiving, “for some, the eggs don’t turn on again,” Richards said. “Unhealthy women, who are prone to thyroid issues and other metabolic issues, are at huge risk,” she added. “When they’re put on progesterone, their eggs shrink. Then they’re showing signs of polycystic ovary syndrome by age 25 or 30.” Polycystic ovary syndrome makes conceiving difficult. She urges women to quit using high progesterone oral contraceptives and the progesterone injections that last for up to a year in favor of oral contraceptives that also contain estrogen, unless risk factors prohibit it, such as family history of breast cancer. She also suggested eating organic to avoid any exposure to chemical sprays, which she said also contributes to infertility. Call 585-244-8400, ext. 216 to learn more. for that age, pattern and rhythm and how much help they need,” Lozada said. “You can bring a loose structure so you have an idea of what’s up and baby has some consistency that respects their individuality.” While your best friends’ baby may sleep six hours at a time by 3 months (lucky them! ), yours isn’t abnormal for waking. Neither baby is “right” but simply different. What you do to soothe the baby makes a difference, as they have preferences, such as rocking, shushing sounds, white noise machines, pacifiers and swaddling; however, teaching self-soothing at around 4 months can help you get more sleep. Laying babies down while yet drowsy helps them learn they don’t have to have you help them transition into sleep. “A good night’s sleep starts in the morning,” Lozada said. “Strengthening the circadian rhythm starts in the morning.” She recommends exposing babies to light at their normal waking time to send signals to their bodies that it’s time to stop sleeping. When it’s time for the night routine, dim the lights and eliminate them until morning. “The biggest thing to focus on isn’t trying to get the baby to sleep longer at night, but keep them awake longer during the day,” said Dr. Heidi Connolly, chief of Pediatric Sleep Medicine Services at University of Rochester Medical Center. She said that newborns nap about three times a day, a few hours after they wake up, afternoon, and in the early evening. If possible, eliminating the early evening nap can help. “Newborns need to eat in the middle of the night, but after a few months old, they don’t really need to nurse in the night,” Connolly said. “Feeding them then encourages them to wake up and feed.” Above all, ensure babies need to sleep safely. The American Academy of Pediatrics states that babies should sleep on their backs, alone, and in a crib with immobile sides containing nothing but a firm mattress and a fitted crib sheet. Babies do not need pillows, crib bumpers, blankets, stuffed animals, bottles or anything else in their cribs. Placing cribs near parents can keep babies safe, yet close by for feedings and comfort. Cancer survivor Terry Werth, 71, in front of the Erie Canal. She has recently published “Goodnight Spencerport,” a children’s book set in the west side village of Spencerport. either.” So she kept writing and processing and soon the essays, the poems, and the letters were numerous enough to compile into a book. In 2011, Werth published “Pink on Pink: Writing My Way Through Breast Cancer” (Creative Energies 2011). west side village of Spencerport. Because she knew the village and its landmarks so well, the text came quickly to her. What took a little more time and research was the compilation of the extensive glossary in the back of the book. The glossary consists of four pages of detailed historic information about the places shown in the story, including instructions on how to do further research online. The final piece to the puzzle was the addition of colorful photos of the village. After seeing a striking photo of a full moon over the canal in Spencerport, she sought out the photographer. It turned out that educator and photographer Joe Pompili not only lived in the village, but he lived just down the street from Werth. Werth was excited to collaborate with Pompili, who took more than 300 photos for the project. “He had the same love of the community that I did. I felt like it was a great match,” she said. Phyllis Leathersich of Spencerport was thrilled when Werth released “Goodnight Spencerport.” She purchased a copy for each one of her seven children, “because they all have children and I thought it would be a nice way for them to teach their kids about where they came from. I was really excited about that.” In 2018, Werth read a news story about another Spencerport woman, Maria Delgado Sutton, who was putting together care packages for residents of Puerto Rico affected by Hurricane Maria. Werth was eager to help Delgado with the “One Box At a Time” project and donated copies of her books for the care packages. But her assistance didn’t end there. Werth helped Delgado organize a fundraiser at their local library. The event raised enough funds to send 64 boxes directly to residents in Puerto Rico. Werth also accompanied Delgado on a trip there last December. Delgado was impressed with Werth’s determination and willingness to give of herself. “Terry knew that this was not going to be a pleasure trip to Puerto Rico, we would have to foot the bill for our plane fare, baggage, and expenses. This trip was made with a mission in mind,” Delgado said. “We were able to pack four suitcases full of food and school supplies. It was her idea to reach out to Jet Blue Airlines to request a waiver for our suitcases, which they granted,” she added. “Terry is always busy doing ‘something’ and always for the benefit of others. Terry is so thoughtful; she is genuine in wanting to know what others’ concerns are and does her ultimate best to help them. She has a big heart and gives from her soul.” Werth is also a certified funeral celebrant and ordained wedding officiant. She says officiant work is very creative and refers to it as “just another fulfillment of my original dreams.” When asked what project she plans to tackle next, she said that she is working on the “Village Gateway Project” in Spencerport. Project organizers are seeking to remove two deteriorating CSX railroad abutments in the village. “It’s an effort to aesthetically balance the entry from the south end of the business district with all the improvements made over the years on the north end,” she said. She continues to write and hopes to publish more work soon. To learn about Werth and her books, visit goodnightspencerport.com and teresawerth.com. betes and cancer all rise after menopause. Most women visit their primary care doctor or gynecologist once a year for a “well-woman visit,” which insurance now covers with no copay. Even height, weight, and blood pressure checks at your visit reveal a lot about your health risks, and you and your healthcare team can discuss other tests you might need, such as cholesterol measurements, PAP tests, and mammograms. Physical inactivity, obesity, and unhealthy eating, smoking, and excessive alcohol consumption increase the risk of heart disease, stroke, diabetes, and cancer. The evidence continues to grow that getting active, losing excess weight, and healthy habits can reduce these risks. they last considerably longer — as long as 10 years, depending on when they began. For a small proportion of women, they may never go away. It is not uncommon for women to experience a recurrence of hot flashes more than 10 years after menopause, even into their 70s or beyond. There is no reliable way of predicting when they will start — or stop. depression, called selective serotonin-reuptake inhibitors (SSRIs), have been found to be effective in treating hot flashes in women who don’t have depression. The only SSRI FDA has approved thus far for treating hot flashes is paroxetine 7.5 mg.
Is Your Medicine Safe at Home? Only YOU Can Secure Your Rx! We specializing in both permanent and non-permanent techniques, gradual hair replacement, and system integration. We can provide topical hair loss treatments and laser hair rejuvenation. Check out Virtual Reality Hair Replacement for Men at Baldness.com. Help us prevent addiction, accidental poisoning & protect the environment! Victor: Meade Square Pharmacy Questions, please call us at 585-396-4554. WE’RE HIRING! Trillium Health is growing, and we’re looking for candidates like YOU! Currently recruiting: Behavioral Health Specialist, LCSW-R Case Manager, Grants Medical Transportation Specialist Patient Service Representative Registered Nurse Retention & Adherence Specialist Social Worker, Adult Day Health and more! To view these positions and others, visit trilliumhealth.org! Everyone wants to live longer. But nobody wants to get old. So tell me, how does that work? At St. Ann’s Community, we believe that the key to staying young is feeling young. That’s why we provide a full range of senior services designed to keep you healthy, active and enjoying all that life has to offer – no matter what your birth certificate says. the dose, the number of pills, and where you live. Then they will show you what you can expect to pay at various pharmacies if you use their discount coupons or vouchers, which you can print out or download to your phone to show a pharmacist. • Pay cash: Most generic medications cost less if you don’t use your insurance. For example, chains like Target and Walmart offer discount-drug programs that sell generics for as little as $4 for a 30-day supply and $10 for a 90-day supply if you pay out-of-pocket. While some insurance companies charge a $10 copay for a 30-day supply. Also ask your pharmacy if they offer a drug discount card program and compare costs with your insurance plan. You can also find free drug discount cards online at sites like NeedyMeds.org, which can be used at most U.S. pharmacies. • Shop online: You can also save by using an online pharmacy like HealthWarehouse.com but be sure to use an online retailer that operates within the U.S. and is licensed. The site should display the VIPPS symbol, which shows it’s a Verified Internet Pharmacy Practice Site. • Search for drug assistance programs: If your income is limited, you can probably get help through drug assistance programs offered through pharmaceutical companies, government agencies and charitable organizations. To find these types of programs use sites like BenefitsCheckUp.org, PatientAdvocate.org, RxAssist.org and NeedyMeds.org. Laser Gum Treatment in Rochester, NY What is laser gum treatment or LANAP? Laser Treatment is an advanced technique for your doctor to treat periodontal (gum) disease and save many teeth that were previously considered hopeless. A laser light is used to gently remove harmful bacteria and diseased tissue from the gum pocket. A. Perio probe indicates excessive pocket depth. B. Laser light removes bacteria and diseased tissue. C. Ultrasonic scaler and special hand instruments are used to remove root surface tarter. D. Laser finishes cleaning pocket and aids in sealing the pocket closed so new germs cannot enter. E. Healing of gums to cleaned root surface occurs. F. Bite trauma is adjusted. G. Healing occurs. A. Perio probe indicates excessive pocket depth. B. Laser radiation vaporizes bacteria, diseased tissue, pathological proteins and alerts the practitioner to the presence of tartar. C. Ultrasonic scaler and special hand instruments used to remove root surface accretions. D. Laser finishes debriding pocket and aids in coagulation. E. Healing of gums to clean root surface occurs. F. Light trauma is adjusted. G. Healing occurs. All these people have gum pockets 5mm or greater, and the higher classes of gum disease correspond to deeper gum pockets and more loss of bone support to the teeth. All classes of gum disease greater than Class I are candidates for Laser Gum Treatment. chieving the best possible outcome after a heart attack or other cardiac event takes time and expert care. Upon discharge from the hospital, a short stay at a transitional care center is the best way to regain the strength and independence you need to return home safely. After a cardiac event or surgery, daily activities that were once second nature are more challenging — and potentially dangerous — when you take on too much, too soon. The rehabilitation specialists at the Transitional Care Center at St. Ann’s Community recommend that you receive education and interventions modified to your needs, to conquer these challenges: • Energy conservation: With a limited amount of energy at your disposal, learning how to use your strength wisely and pace yourself is essential. Sitting on a chair in the shower keeps you from feeling depleted by the heat and steam. After getting dressed, do some breathing exercises or take a two-minute break to recover before going on to the next task. • Activity tolerance: A series of exercises and endurance training can help you increase your standing tolerance so you can do simple things like shaving and brushing your teeth. • Breathing: Instead of allowing a painful sternal incision to impair your breathing, holding a pillow to your chest can make taking deep breaths easier and deliver enough oxygen throughout your body. • Adaptive equipment: Avoid overexerting yourself with the help of adaptive equipment that eliminates the need for you to bend down, reach overhead or walk without assistance while doing daily activities. Examples include using a sock aid for dressing and a wheeled walker for stability and support. Your occupational therapist will recommend equipment based on your condition and help you learn how to use it properly. Choosing the best place for your needs. Rochester is fortunate to have several transitional care centers, so it’s essential to find the one that will give you the highest likelihood of returning to your prior living situation. Look for: • Interdisciplinary teams of medical, nursing, therapeutic, dietary and social work professionals to manage patient care after cardiac or other health events, including after discharge to home to ensure your safety • Admissions seven days a week • Rehab six days a week for the quickest possible recovery • The latest technology to help you get more out of rehab, faster • Be sure to ask about patient outcomes, too. • Where you go for rehabilitation is up to you. Where you go for rehabilitation is up to you. Having a cardiac event is a wakeup call. A successful rehabilitation experience helps you learn new ways to care for yourself and regain your independence so you can get home as soon as possible. So be sure to include a transitional care stay in your recovery plan. Sharon Osborne – is executive director of Transitional Care Center and Rehabilitation Services at St. Ann’s Community, a senior community offering a full continuum of care in Rochester. Email her at sosborne@ MyStAnns.com, call 585-697-6483 or visit www.stannscommunity.com. H ealth News St. Ann’s, Catholic schools to offer tuition assistance St. Ann’s Community will partner with the Diocese of Rochester Catholic Schools to offer family tuition assistance to nursing employees. The four-year pilot program offers significant tuition reimbursement for children of St. Ann’s nursing employees to attend any one of the Catholic schools in the Rochester Diocese. The program is open to any full or part-time benefit-earning licensed practical nurses (LPN) and registered nurses (RN) at St. Ann’s Community’s Irondequoit and Webster locations. St. Ann’s also welcomes new RNs or LPNs to participate in the program. St. Ann’s will provide up to $5,000 of tuition assistance per household. The benefit provides eligible employees up to $3,000 (for elementary and middle school level) or up to $5,000 (for high school level) of tuition assistance. “This new benefit is part of our ongoing effort to attract and retain top nursing talent,” said Bob Bourg, senior vice president of human resources. “We wanted to do something meaningful that could positively contribute to our nursing employees’ lives and their families.” “We know how difficult it can be to send children to private school,” said Michael McRae, President and CEO of St. Ann’s Community. “As an organization founded in the Catholic tradition of excellence, we believe strongly in the value of a Catholic education. If we can help support our nursing employees and defray some of those costs for their families, we see it as a win-win.” St. Ann’s Community has a rich history of investing in their workforce through programs such as college tuition reimbursement, awarding scholarships and giving of grants. nationwide chosen as a rising stars winner, and the only award recipient from New York state in this category. The rising stars category specifically recognizes women aged 40 or younger, or with less than 15 years of experience in the profession. Recipients will be honored at a special event in Chicago in May. Brookes’ commitment to aging services began in her teens, when she volunteered at a local assisted living residence for people with dementia. Her interest in serving those with Alzheimer’s disease and related conditions grew through continued volunteerism and internships at regional Alzheimer’s Association chapters and other aging services agencies. Brookes’ career accomplishments include professional research and presentations focused on aging issues; innovative approaches to process improvements; and being selected into the fellowship programs of the Connecticut LeadingAge Leadership Academy. Brookes currently resides in Greece. “We are very proud of Vanessa and grateful for her commitment and service to our organization. Those we serve greatly benefit from Vanessa’s dedication to addressing the needs of older adults, particularly those living with Alzheimer’s disease,” said Glen Cooper, president and CEO of Friendly Senior Living. may need and reaching out to them proactively. With a business engineering degree, Hardy has been analyzing data and interpreting that data to create solutions from the start of her career. She received a bachelor’s degree in electrical and computer engineering from Clarkson College of Technology. Highland Women’s Health practice opens new location Highland Hospital has opened a new Highland Women’s Health practice, located at 800 Ayrault Road inside the Perinton Medical Center. An open house celebration was held March 13. Providers at the new location include physicians Carole Peterson and Kara Repich and nurse practitioner Theresa Seguin. The new office features a more spacious and modern environment as well as free parking. 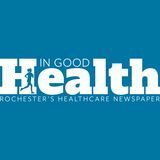 Officials at the hospital say that with multiple locations across Rochester, Highland Women’s Health makes it easy for patients to get check-ups and preventive screenings, manage birth control, and receive expert prenatal care. All locations offer comprehensive obstetrical care for low-risk and high-risk pregnancies. They also provide comprehensive gynecological services, from annual exams and family planning to the treatment of menstrual, pelvic organ, and pelvic floor disorders to menopause management. senior population in Monroe County. St. Ann’s adult day programs are ideal for adults who need medical services or skilled nursing care, have a chronic illness or memory problems, are socially isolated or depressed or have decreased mobility and need rehabilitation support. “We know there is a growing need in our community to serve older adults that want to remain living at home but may need assistance with medications or desire more social activities,” said Michael McRae, president and CEO of St. Ann’s Community. “Adult day programs also offer a much-needed respite for caregivers while providing a safe, supervised, social environment for loved ones during the hours when it is needed most.” For more information on the adult day program at Durand Senior Apartments, contact Rola O’Meally at 585-697-6365 or email romeally@ mystanns.com.